It was often said that during the American Civil War, brothers fought against brothers. Mostly they fought on opposite sides but they didn’t see each other at the same battle. This book tells of a rare exception and follows two brothers, one in the 2nd Virginia, Stonewall Brigade, CSA and the other from the 87th Pennsylvania, USA as they fought against each other in two battles in the Shenandoah Valley during 1861-1863. The story is based on over 90 letters from the participants and other members of their regiments, the regimental records, and official records of the conflict. Bob O’Connor has once again crafted a Civil War novel that brings his characters into our present day lives with accuracy, excitement, and details. 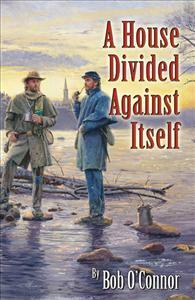 His most recent historical novel, A House Divided Against Itself, weaves the tale of two brothers, William and Wesley Culp, raised in the same home in Gettysburg, Pennsylvania, but whose adult lives travel very different paths. Anger, resentment, and rivalry bring them to become soldiers on opposing sides. O’Connor weaves life on the battlefield and the lives of those left at home in his newest story. The absurdity of war was as present during the Civil War as it is in our lives today. The soldiers thought, mistakingly, that the conflict would be over in a matter of days, then weeks, then months. Bob’s depth of feelings in his characters leads the reader to anger, frustration, shock, and sadness at the sorrow of war through the lives of these real individuals. A House Divided Against Itself takes you back to the beginning of the story of Jenny Wade, brothers William and Wesley Culp and John Skelly. Many of us know the fate of these people thru our minimal history lessons in school. But most of us do not know the beginning of their journey. Where did it all start for them? Why did they make the decisions they did that affected their lives forever? Did love and passion contribute to their outcome? Mr. O’Connor brilliantly exposes each character’s deeply personal and moving accounts of the war, using historical information and actual letters exchanged between the participants. This is a book that you can’t put down once you start reading it!